Our hotel provides the best dog boarding experience for your pet with all of the love and attention you’d give. We know you don't want to leave your dog, but when you have to, let us ease your mind and care for your companion like you would. You want what’s best for your dog, but sometimes work or vacation travel takes you away for a while. That’s why Pooch Hotel offers loving care for your companion while you’re away that is both convenient and affordable. We know you have a lot of choices, including pet sitting, but dog boarding with Pooch Hotel offers much, much more! Instead of pet sitting, why not allow our staff of experienced and trusted professionals to give your dog the best care possible? Dog boarding with Pooch Hotel is like a vacation for your four-legged friend. We provide a safe, fun environment for group play, while also offering all dogs their own room for privacy, comfort and a little “me time.” There are three types of rooms available, each with natural lighting and tempered glass doors to give your pet the utmost care and security. With pet sitting, your dog may only get one or two visits per day. Pooch Hotel, on the other hand, is fully staffed 24 hours a day, so pets get the attention and care they truly need. We know you’re the best caregiver for your companion, but we like to be the best while you’re away—because we love dogs. Pooch Hotel offers amenities that simply aren’t available with most pet-sitting services. Instead of missing you, your pet will enjoy the opportunity to meet other dogs. 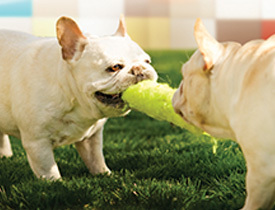 All Day Play is available at no extra charge for well-mannered, socialized dog boarding guests. Individual Play is also available for companions that prefer more specialized attention. Customize your Pooch Hotel dog boarding experience with a day at the spa and a new hairdo. Or, request extra snuggling and a daily rub down for some additional love. Pet sitting meets the basic needs of your companion such as feeding and walking a few times a day. But at Pooch Hotel, your dog’s needs and wants are met and surpassed, day and night, by a staff of caring professionals. We want nothing more than to make your dog’s time away from home memorable. Don’t be surprised if your companion can’t wait to come back for another vacation! Please visit our Pooch Hotel Policies for Health Requirements, Check-In/Check-Out and Cancellation policies. We keep them simple and all together for your convenience. * Indoor pool at select locations. New clients will set up a profile on our on-line portal as a part of your first reservation booking. 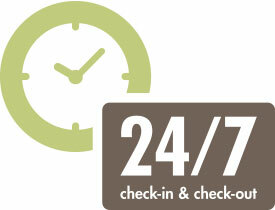 *See standard check-in check-out, off-hours check-in/check-out and Pricing, Terms & Package Expirations for more information. Suites come with tempered glass doors and spacious accommodations. Also includes group playtime with webcams and potty breaks. The perfect accommodations for the savvy shopper who still wants it all for their dog. Includes standard features, plus a flat-panel TV and a webcam in suite. Also includes group playtime and potty breaks. Our presidential suites give your pet the perfect mix of amenities to keep them entertained all day and night. Our largest and most deluxe room features fluffy raised bedding, a flat-panel TV, and a webcam in suite. Also includes group playtime and potty breaks. The palace suite is perfect for the most discerning pups looking for comfort during their stay and play. Give your pup plenty of play and exercise when you drop them off for daycare or let them freshen up with a Pawdicure and Brush-out in our spa. © 2019 Paradise 4 Paws, LLC. All rights reserved. All trademarks displayed on this website are the property of Paradise 4 Paws, LLC or its licensors.